Welcome to my blog everyone! I created a card for a sick friend today. This is my first try at coloring in redheaded hair and I love the way it turned out! Now I will send you back over to the Tiddly Inks blog so you can hop on over to the next blog. Thanks for stopping by and have a great day! Tiddly Inks image - Whatcha doing? Superb card. Love it with this sketch and the image is one of my faves. It was my first Tiddly purchase ever along with Everyday Princess so holds a special place in my heart. Love your bright DP and the inside knocks my socks off - FAB FAB FAB! Well done on your first red-head, love it! Thanks for hopping along with us at Tiddly Inks! Great job! I love redheads! This will cheer up your friend so much hun because it is fabulous and your red hair looks awesome too!! I love this card, I love how it looks like she's in bed (or at least it does in my mind). Great colouring and fab papers! A very adorable card! 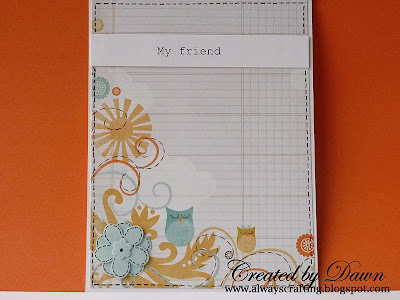 I love the design papers you used, the colours are so pretty. Thanks for hopping with us today!! This is so cute! I bet it cheered your friend up! Love the inside too! Super CUTE!!! Loving those papers with this image! She is darling and your sentiment is perfect too! Thanks for joining our Tiddly blog hop! Cute, I have this image too and love her! Beautiful card! So cute! I love how she's peeking out. 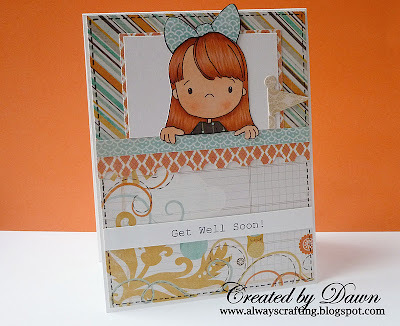 very neat card- love that you decorated the inside as well. This is adorable! Fabulous coloring. Good luck!! Dawn, this image is so versatile, don't you think...it can be used for any occasion, i love what you did! Aw....I'm sure your friend will appreciate it! good job with the red hair!! it is a sweet card and will definitely cheer someone up. Cute card. Inside and out. so sweet! What a wonderful idea .... would cheer anybody up! Cute card! I hope this helps to cheer your friend up! So glad you could play along with our hop today! This is so cute Dawn! I love what you have done with the sketch! Your papers and colouring are fab! Lovely red hair! Thanks so much for joining in the Tiddly Inks Hop! This is so adorable. Love the little paper pieced hairbow. Aw, this is very sweet, and sure to cheer up your friend. Gr8 card inside and out. So sweet and I love how you have her popping up on the image! 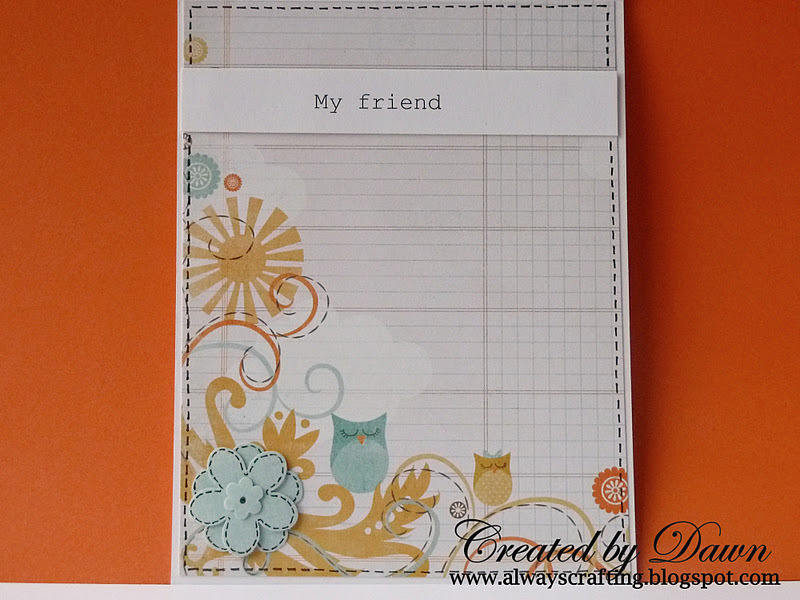 Thanks for playing along with us in the Tiddly Inks blog hop! Oh my goodness, this is cute! I love the image and the awesome papers! What a sweet card! That will surely brighten your friend's day! 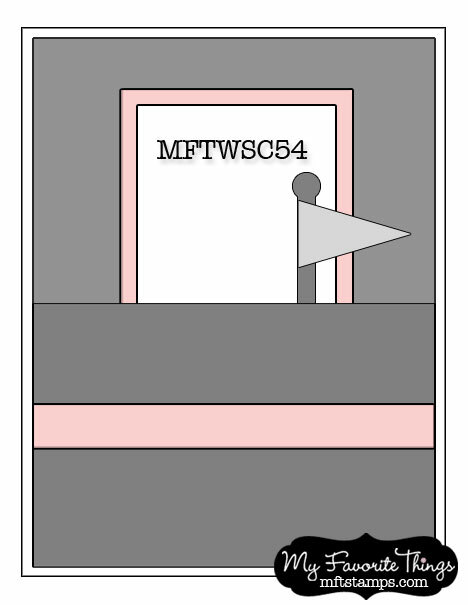 I like how she's peeking over the strips of paper. You did a great job coloring her hair! I think red hair is a lot of fun to color.